The Hollies entered the summer of love firing on all cylinders, and then Graham Nash picked the wrong single, and it all came crashing down. An infectious slice of fairground magic: The protagonist rides the carousel, chasing his dream girl, constantly changing horses, but not quite catching up to her until we reach the final verse and testosterone order is restored in a whoosh of harmonic voices, the colour of rainbows. The melody rotates like a carousel around the recurring guitar theme (with a slight banjo sound), first verse sung by Nash, second by Clarke, and as they approach the chorus the group’s trade mark turbo kicks in, full force, the three-part harmonies splash out of your speakers like liquid stardust. It’s a simple story, and in lesser hands it would have turned into a tacky piece of candy floss, but the performance is so strong and the arrangement so clever that the song becomes a wonderful statement of pop art. 1967 had started. The Hollies were up for the challenge. B-side “All The World Is Love” is built on a quirky rhythmic structure, moving beneath distant chiming guitars, although a bit monotonous, its oriental seasoning (traces of “Revolver”) and love-message makes it an early example of English psychedelic whimsy. The Hollies anticipate the ‘summer of love’. Italian only release, recorded during the “Evolution”-sessions in January 1967. The Hollies sang this number (written by legendary Italian song-smiths Mogol & Lucio Battisti) at the San Remo Festival later that same month, but failed to reach the finale. The only comment relevant here is why? A-side a Kurt Weill like march with a standard beat group chorus. B-side (credited to Speechia/Martinia) a happy-go-lucky ditty, typical Italian pop for its time, and maybe relevant to Herman’s Hermits. Allan Clarke carries both songs more or less alone. He does not sound comfortable. The follow-up to the massive hit “On A Carousel”, and just as catchy. Carrie-Anne Moss was named after it. Released as the world was entering “the summer of love”, and on top of the radio DJs’ playlists along with “Sgt. Pepper”, “A Whiter Shade Of Pale” and “All You Need Is Love”. A spectacular production that incorporates Latin American percussion (including a marimba solo) and razor sharp three part harmonies, the melody is so simple you know its refrain by heart even before The Hollies have come half way through its first appearance. The three composers sing one verse each. Clarke handling the first followed by Hicks, leaving the final philosophical lines to Nash who at this time was trying to push The Hollies in a more socially conscious and psychedelic direction, in step with the cooler names of the day, like The Beatles, Pink Floyd, Jimi Hendrix, The Byrds, Buffalo Springfield. He had even started to dress the part. “Carrie Anne” wasn’t quite there, though, as its lyrical message was rather lightweight, but the performance made the whole thing sound right. Bright and summery, catchy pop in kaftans. B-side is an appealing folksy mid-tempo ballad that takes us from winter to spring. Traces of Simon & Garfunkel in “Bookends” mood. Another Italian job, recorded for the soundtrack of the movie “Fai In Fretta Ad Uccidermi….Ho freddo !” At least these two songs are their own and sung in English. A-side is a tight, up-tempo raver with nice harmony singing and a wailing harmonica. B-side’s got Hicks’ quivering guitar as a bait, the song itself strolls merrily along, but in 1967 it sounded dated by the group’s current standards. Only released in Italy. Wonderful psychedelic sleeve, released at the same time as “Sgt. Pepper”, but although an impressive step into the new sounds of the day, not in the same league. All 12 tracks written by Clarke/Hicks/Nash, and none of them released as singles. A close cousin to “For Certain Because” with bright tunes that sparkle with three part harmonies and reverberating guitars, but wrapped in feathers, velvet and cellophane. Nash no doubt is responsible for the more whimsical lyrics, well meant, but sometimes crossing into the silly, like “Ye Olde Toffee Shop”. But overall a collection of very strong tunes, performed by an inspired combo in its prime. And this is where it all went wrong. Mainly written by Graham Nash who defiantly insisted that it should be their next single. Maybe he thought it would blow people’s minds. It is hard to see how. It’s just a song about a loser who can’t seem to do anything right, now he warns his girlfriend, leave, save yourself, I’m bad karma. The last verse dives a few inches below the surface and suggests that perhaps the song concerns itself with more fundamental questions than one was led to believe, it turns out that the protagonist is even afraid of losing his soul. There’s nothing in the preceding verses that leads up to this piece of terrifying gloom, but credit to Nash for going there. It’s an unexpected turn of events for a Hollies single. The story is set to a melody (mainly written by Clarke according to an interview he gave New Musical Express in October 1967) that begs for an intimate acoustic arrangement, quite similar to what one would later expect from Crosby, Stills & Nash. 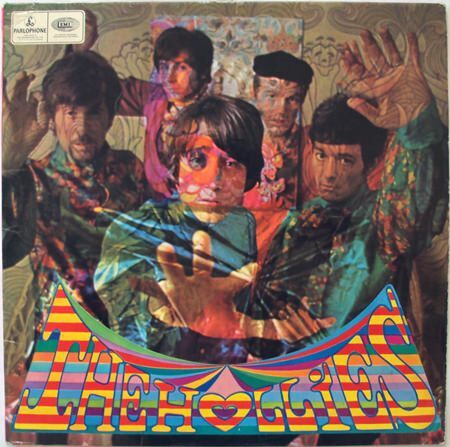 The Hollies’ solution starts out promising: the guitar intro is delicious, and the verses stabilize themselves on a simple, but captivating chord progression. The chorus however, is surprisingly tame. They definitely should have put more work into it. They treated this little campfire song as if it was an epic. Inviting Johnny Scott and his orchestra in, and Scott’s overblown and busy arrangement deprives the tune of all intimacy. The song’s potential is drowned in strings, horns, choir, the works. “A Day In The Life” it is not. 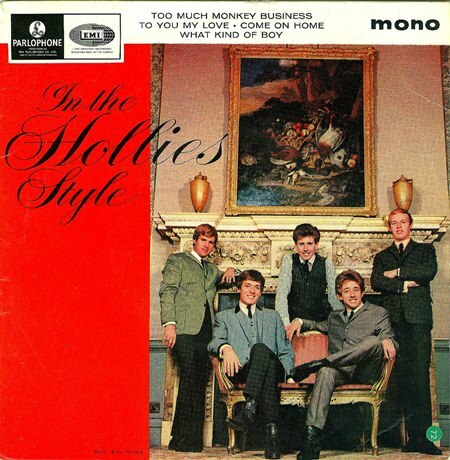 “King Midas In Reverse” only reached #18, The Hollies’ worst showing in the Top 30 since the disastrous “If I Needed Someone”. There’s a fragile and beautiful tune hidden in there, if properly arranged it would have fit perfectly on their “Butterfly”-album. Why didn’t they release “Dear Elolise” instead? B-side, “Everything Is Sunshine” is a lightweight ditty with some nice guitar picking and traces of psychedelia sprinkled on it. Nash takes the lead vocals, telling us that everything is sunshine when his girlfriend lets him hold her hand. The “King Midas”-fiasco unfortunately had terrible consequences for The Hollies, or at least for Graham Nash’s plans for the group. The others reluctantly accepted the single’s release. 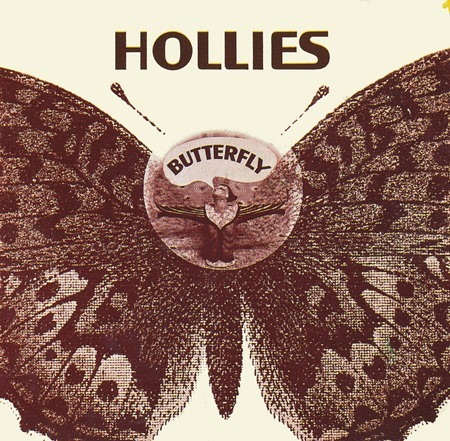 They also tagged along when they created “Butterfly”, The Hollies’ masterpiece. But as The Hollies’ standing had plummeted after “Midas”, they were now presented with the ultimate blow. “Butterfly” bombed too, it didn’t even show up in the lower regions of the Top 15. Nash’s time as the leader of the band was over. What a pity, as “Butterfly” is a gem, a contender for inclusion on anybody’s Top 100 albums of all time. Nash dominates the contents, but it’s still a group effort proven by Tony Hicks’ exceptional “Pegasus” and Allan Clarke’s majestic wall-of-sound epic “Would You Believe”. There’s whimsy (Wishyouawish), naked beauty dipped in dope (Butterfly), oriental left-turns (Elevated Observation) and high spirited, delicious pieces of bright and colourful pop (Dear Eloise, Postcard & Away Away Away). 12 tracks and not one dud. Why people didn’t buy this album in truck loads I still don’t understand. 1968 was the year when the Tony Hicks/Allan Clarke-faction overturned Nash and took control of The Hollies. It was back to the showband outfits and the cabaret circuit, and then they set out on a project that Nash hated fervently: A full album of Bob Dylan-covers in lush arrangements. But before they came that far a new single had to be recorded. No more experiments and mind-expanding lyrics, this one had to be super commercial. So Nash found himself in the humiliating situation of having to sit down with Allan Clarke to write a good old fashioned, easy on the ear pop tune with no other ambitions than to sell. The result was “Jennifer Eccles”, hummable, elegant and immaculately performed, wearing a smile on its face, winking and whistling at the girls, even leaving a trail of jolly la-la’s in its wake. All honour to Nash, who wholeheartedly set out to make this an effortless winner. “Jennifer Eccles” captures the sound of spring. “Open Up Your Eyes” is a merry chugga-chugga showcase for their three part harmonies, Clarke, Hicks and Nash sing one verse each, and you are served a banjo solo to go. Collects 14 of their 17 single A-sides (so far), most of them appearing on an album for the first time (although by mistake an alternate take of “Yes I Will” was included). Rounds off with “Jennifer Eccles”. 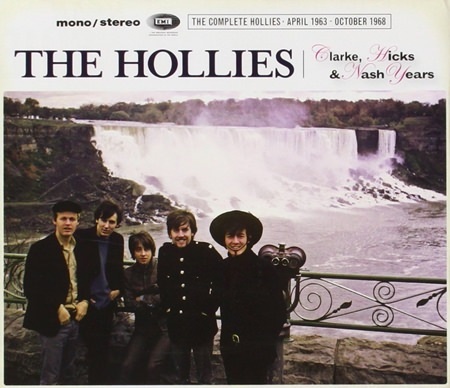 Became The Hollies’ biggest selling album and their first to hit #1. Graham Nash gave The Hollies his final blessing before he left for the US and Crosby, Stills & Nash. “Listen To Me” is his farewell. A Tony Hazzard composition, performed and arranged as if it was their own. Supreme craftsmanship, impossible to dislike. The chorus is loud, soaring skywards, voices shimmering like stardust and quicksilver. 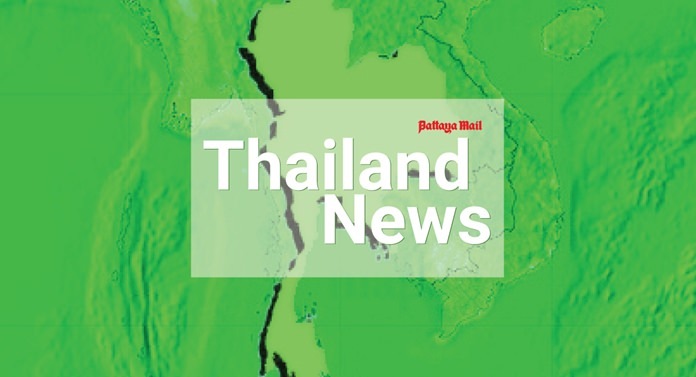 The verses pass like the coaches of a local train, skipping merrily along, one after the other, Bobby Elliott acting as brakeman in a playful mood. 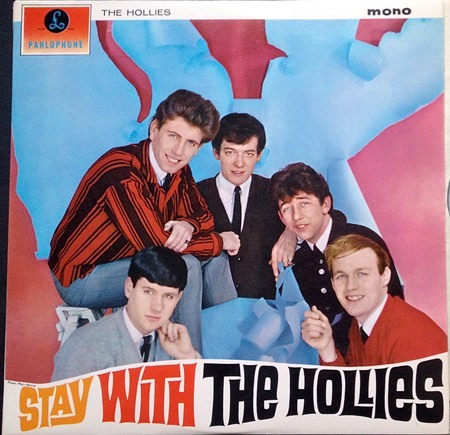 A nearly forgotten gem in The Hollies-catalogue, check it out. “Do The Best You Can” puts the banjo up front, there’s a lot going on, wailing harmonica, criss-crossing harmony vocals, stop-start rhythm, but the chorus isn’t strong enough to carry this box of tricks to a fitting conclusion. This then concludes our voyage through the classic Clarke/Hicks/Nash-years, 1963-1968. An impressive stack of records, some of which were as important for the 60’s as the more familiar songs by The Kinks, Small Faces, The Who, and yes, even The Stones and The Beatles. The Hollies were family. They are still out there playing live. God bless ‘em.